Despite the crystal clear recollection of being cajoled by my uber-health conscious aunt into gnawing on roasted carob pods as a mere pup – and the unholy sensation of sweet yet bitter tannins lingering long after I spit the chewed up tree bark-like bits out into a trash can (yesâ€¦ I even scraped the residue off of my tongue with a paper napkin, to no avail) – I try to maintain an open mind when it comes to more wholesome treats. My admitted hatred for the cocoa bean imposter notwithstanding, Oh Yes You Candy! has pulled off a massive lip-smacking coup, one which â€“ not surprisingly â€“ has resulted in them coming soon to the shelves of both Dylanâ€™s Candy Bar and Whole Foods. 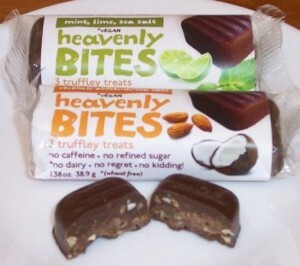 Their remarkably satisfying, truly flavorful yet undeniably good-for-you Heavenly Bites – available hazelnut-vanilla-chai, mint-lime-sea salt, peanut butter-brown rice, and coconut-almond-sea salt (my personal favorite) – are free of all chemicals, dairy, animal products, and refined sugar. Each cellophane-wrapped package contains three square, dense truffle morsels made with a combination of grain-sweetened carob chips, organic coconut oil, and (depending on the flavor selection) additional ingredients such as nuts, coconut, spices, brown rice crisps, and organic flavoring oils. Allowing one to melt on your tongue is an exercise in pure mock-choc bliss, made all the more enjoyable by the fact that itâ€™s shockingly absent of all the bad stuff that always seems to make candy so guiltily yummy. Due to the inclusion of coconut oil (a vegan-friendly, nutrient-rich, yet highly saturated fat) each treat is bestowed with the full bodied texture one might expect of a mainstream, empty calorie offering. Thatâ€™s good from a mouth-feel standpoint as well as an artery perspective thanks to its high lauric acid content, which is believed to bump up good, high-density lipoprotein cholesterol levels. Even more notable is the fact that Oh Yes You Candy!’s carob base lacks the much reviled flavor profile and dastardly aftertaste of the unadulterated pod that haunts me and so many others to this day. Plus, the stuff just tastes creamy-rich-decadent-goooooood. Whether you’re eager to liberate yourself from sugar enslavement or you merely just appreciate surfing the wave of confectionery offerings for something new and exciting, I heartily recommend giving Heavenly Bites a whirl. Indulging just once will inspire you to become a devout carob believer!